The city never turns off. 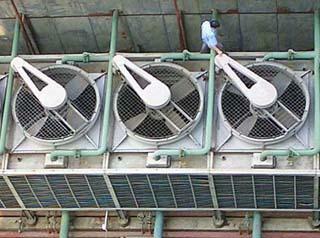 There is always the continual whirr of what I guess are extractor fans. Their flat-line broadband noise is almost indiscernible during the day what with the traffic noise and general hubbub of city life; however, at night and especially early morning, they can be easily heard acting as a sort of acoustic blanket covering up the detail of the quietest sounds. For rest from this continual noise one has to escape to the lanes as even the ‘natural’ world offered by the parks suffers from our modern day infatuation with noise producing technology: mainly traffic or the hum from buildings close by. In the lanes, the best bet is to find a courtyard, however whilst they might be free from air-conditioning humming, these places, of course, are not silent – they have their own sound worlds…. The girls employed to stand on either side of the entrance of the various fashion boutiques simply shout. 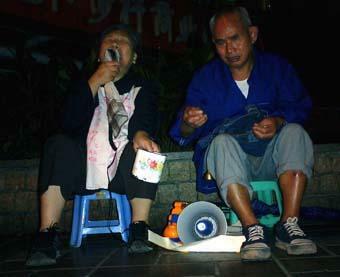 Most other shops make use of loudspeakers to either pump music onto the streets or announce what they are selling. It is the megaphone, however, which for me makes the most significant contribution. It is used by a wide variation of people – from the elderly blind couple who busk in Jiao Chang Kou to almost all the smaller shops as well as many market traders. In most cases the megaphone’s internal memory chip is employed to record a short message which is then looped when playback is operated, each loop being separated by a quick double click. This repetition of the recorded announcement highlights the musicality of the Mandarin accent and so a walk down a street filled with small shops, with all the loops gradually going in and out of phase, is like walking through an early Steve Reich composition. All around Chongqing, but especially in the area incorporating the city centre and harbour, are Chongqing’s famous porters. For 2 Yuan they will carry whatever needs to be transported and deliver it using only their bamboo carrying pole and some rope. 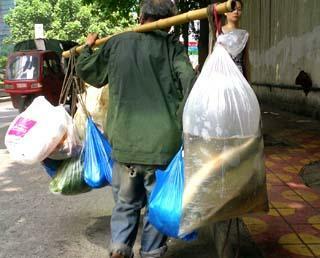 Sometimes the variation of what they’re carrying, as well as what the weight must be, almost beggars belief. Even all my installation audio equipment arrived this way this afternoon: hanging from rope attached to either end of a bamboo pole. Apparently, Chongqing is alone in having its own culture of stick carrying porters, and therefore their sonic contribution is important in terms of any understanding of the city’s soundscape. My experience is that this contribution is threefold. First, is the calling for a porter, and this is the phrase “bang bang”, so if there’s something to be carried then all one has to do is call. Second, is a sound that has been frequently mentioned in the project’s sound description submissions, and that is the rhythmic chants uttered by the porters to help with and co-ordinate their carrying, especially if the job in hand requires a group of them. And, finally, my favourite is the sound produced in between jobs when they sometimes drag their pole behind them. On this occasion one can hear the hollowness of the bamboo, whether it is cracked or not, and also the make-up of the surface it is in contact with. With just over a week to go before everything needs to be completed it’s exciting to see all the various components of the installation beginning to come together. As well as creating the work I have also been involved in the decision making process regarding every aspect of the design of the exhibition space. Of course, this has been interesting but it has also been very time consuming. Now, however, the results all our planning is becoming evident. Over the weekend the false walls required to separate the installation area have been erected and yesterday have been painted. Today l have been working on what will become the visual element for the installation, converting the sound descriptions contributed from the general public into a suitable format to be installed over the weekend. If all goes to plan, tomorrow will see the arrival of all the audio equipment. This air of anticipation is not just confined to my installation. As the museum itself is nearing completion so the work needing to be done changes. Likewise, downtown the short, sharp sounds of construction are moving onto other areas and the centre is regaining a calmer ambience and consequently it is now easier to hear the detail in the sounds of the life of this amazing city. Connected with my installation are various outreach projects encouraging the Chongqingese to think about their sonic environment. Through posters, internet, the media, university seminars and schools workshops young and old have been invited to submit descriptions of their favourite sounds. These have then be used to inform my creative process – specifically, which sounds are most in the minds of the local people and therefore I might work with, and also the language they use to describe what they hear and this is also contributing to the accompanying text based visual element. A series of regularly quoted sounds are connected with the hot pot restaurant, which one writer summed up as “the music of life” – from the bubbling in the pot, through to the accompanying sounds of sounds of laughter, ‘hua cian’ and heated discussion. The dish is actually served throughout China although it originated in Chongqing and it is here where it is at its spiciest. 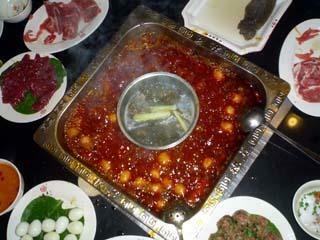 The meal consists of a bowl of boiling soup filled with chillies into which pieces of food are put until cooked. As you might expect from such a cuisine, the hot pot restaurants are filled with the raucous sounds of excited exclamations, and so perhaps it is not surprising that the dish has become integral to an understanding of the city’s very identity. As technology is becoming more used, the sounds associated with purely manual work are gradually being replaced. 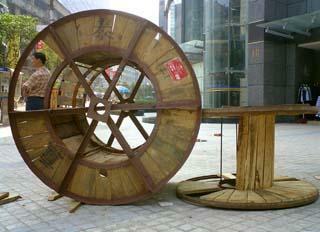 In many cases this also results in the loss of a direct relationship between work activity and sound produced. 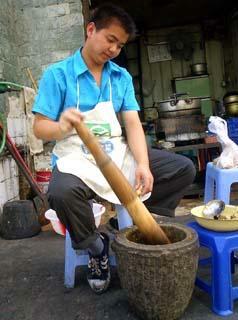 For example, on the street the grinding of spices is done by hand. The sound produced is quiet and intimate: when the grinder speeds up or slows down, so do the resulting sounds; when there is a pause to refill, so the sound pauses. In contrast, the supermarket uses a machine that emits an intense whine like a dentist’s drill and can be heard all over the shop. Another endangered sound is the ‘twang’ of the cotton bouncer. In wintertime people take the cotton filling of their duvets to the cotton bouncer to get them re-fluffed and rejuvenated. The cotton is first put onto a working surface and then brought to life by the vibration of the taut string of a berimbao-type sounding instrument. This too, however, is gradually being replaced by the machine alternative and so soon another musically sounding aspect of the workplace will disappear. 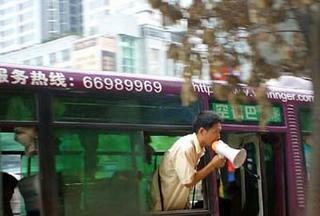 Buses are an essential part of China’s travel network and as the cheapest form of public transport they are usually busy and hence filled with many conversations in the local dialect. Like the taxis they are numerous and also old and their diesel engines can be heard struggling to climb the hills in the slow moving traffic. Unlike the taxis, they lack air conditioning, and so all the windows are open and one travels with the noise of the other traffic. With a squeal of the brakes the bus stops at each designated place followed by the sharp hiss of the hydraulic doors. At this point the driver shouts the name of the location, unless there is a bus conductor in which case then s/he takes this role. If there’s a crowd at the bus stop the conductor will also shout out the window or the open door to inform them of the journey’s destination. Usually this is done by voice alone, though I have seen some conductors also use megaphones. With another hiss of the doors, punctuated by a closing ‘thunk’, the engine noise increases and the next part of the journey begins. With all this activity, one could be forgiven for thinking that no more sounds were needed; however, this is not the case with the newer buses, which boast a television or two blaring out a harsh unrelated environment and adding confusion to what was an already packed, yet coherent sonic picture.